Not many products have memorable packaging. Sunny delight does. Philadelphia cream cheese does. Bombay sapphire does. Now, imagine Philly cream cheese in a red tub instead of it's classic silver rectangle. Imagine Sunny D looking like a gallon of milk. And Bombay sapphire, imagine that as a behind-the-counter fifth of a liter instead of it's gorgeous blue glass. 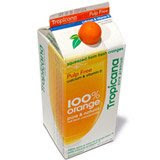 This entire departure from recognizable packaging is what Tropicana did. Old packaging on the left, new on the right. When I first saw the new carton at a meeting last month, I thought it was a generic brand. On it, 100% orange is more prominent than Tropicana. I likened it to a bland, white label black print store brand of canned beans. The only intriguing part of the new package was that the orange pour cap now looked like the outside of an orange. "Interesting, I wonder how much that adds to the price?" I thought. I know, too much obsessing over a carton. Same juice and that's all that matters, right? Not to consumers. Tropicana is ditching the new packaging and returning to the familiar. Smart. Click my witty title for full, journalistic write-up.